ark Twain found the Upper Mississippi otherworldly, serene and bucolic when he traveled through the region 130 years ago. Today he’d find some of those same enduring qualities serving the needs of people and companies decidedly grounded in this world. 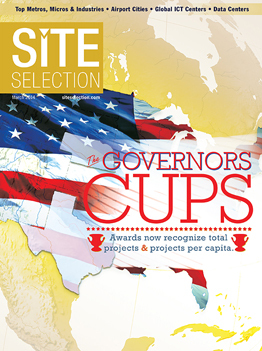 In the same year we mark the debut of a new per-capita Governor’s Cup alongside the traditional Governor’s Cup, Site Selection introduces the Big Muddy Cup, awarded to the top metro area along the banks of the Mississippi River for new corporate facility investments per 1 million population over the 18 months from July 1, 2012, through Dec. 31, 2013. Dubuque, Iowa, Iowa’s oldest city founded in 1833, is the winner of our inaugural award, having attracted 21 projects over that time span with a population of just over 95,000 people. (The city also ties for first in its population tier among our Top Metros of 2013) Dubuque is one of five metro areas and five micropolitan areas making the Top 10. The picturesque bluffs and rolling hills of Greater Dubuque are among several distinguishing features that sometimes surprise first-time visitors. Dubuque is known for its French Canadian heritage, lead mining history and scenic bluffs, not to mention the “Field of Dreams” film location at the old Lansing family farm, and the national farm toy museum, in nearby Dyersville. There’s continuing success at the Port of Dubuque’s $400-million “America’s River” redevelopment that opened in 2002 featuring a convention center and resort, casino, riverwalk, museums and a renovated brewery. The city is known for producing such various products as John Deere backhoes, gelatin, windows, sheet metal, motors, bacon bits and Spam. Those last two are made by Hormel Corp., which early this year moved forward with a two-phase expansion project that will move bacon bits production from a plant in St. James, Minn. (at the cost of 75 jobs there), and bring Spam production to Dubuque. The company’s existing Spam production plants are in Austin, Minn. (Hormel’s hometown); Fremont, Neb. ; Denmark and South Korea. Capacity had been maxed out in Minnesota, said the company. The company sells more than 122 million cans of Spam annually, 90 million in the US alone. Press coverage by the Dubuque Telegraph Herald noted a permit application for a nearly $30-million project at Hormel subsidiary Progressive Processing that may create as many as 91 new jobs in Dubuque. A conditional $4.1-million incentives package from the city and the Iowa Economic Development Authority was in negotiations at press time. There’s no shortage of other projects in the area, including major headquarters and office locations from Durrant Group and McGraw-Hill; and new industrial projects from Camoplast Solideal (in nearby Peosta) and Brightwood Corp., whose pine moldings will be supplied to Andersen Corp.’s nearby Eagle window operation. The city’s older industrial footprint is finding new traction as well: Witness the 16 jobs from Design Mill, a software development firm growing in the city’s revitalized Millwork District. The district was one of seven projects nationally to receive in February the 2013 National Award for Smart Growth Achievement from the US EPA. Another newcomer is Maurice Jones, named economic development director for the city in October 2013. His resume includes economic development leadership positions with the governments of Louisville, Ky., and Cook County, Ill.
John Deere Co. certainly thinks so. That’s why the company in 2012 announced plans for a $44-million, 125-job expansion at its longstanding Dubuque Works facility, including the reshoring of some component manufacturing from abroad. Early this year, the factory celebrated the manufacture of its 250,000th backhoe. Mayor Ray Buol, a native of Dubuque, worked for 30 years at that John Deere plant, and has been director of landscaping and grounds at the University of Dubuque, his alma mater, since 2002. In 2009, Mayor Buol was instrumental in the launch of “Smarter Sustainable Dubuque,” a public/private partnership between the city and IBM Research, the division of IBM responsible for its “Smarter Planet” campaign. Buol knows machines, he knows the soil, and he knows the makeup of the people he leads. So has a 20-year long-range vision, as well as an election platform turned top priority called Sustainable Dubuque, whose 40-person committee devised a plan that was one of the things to catch IBM’s eye in 2007, Buol says. Meanwhile, Greater Dubuque Development has fostered programs such as Opportunity Dubuque, a workforce development partnership that earned a Gold Award in 2013 from the International Economic Development Council. Nor does partnership across state and institutional lines. Buol recalls how college presidents from University of Wisconsin-Platteville and other Wisconsin and Illinois schools, plus the three colleges in Dubuque, showed up to personally tell IBM how their collective resources and enrollments could fill the company’s workforce pipeline.